TV shows often feature "Crash Reels" to highlight dangerous situations or high profile injuries. 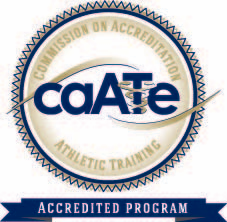 The Saint Louis University Athletic Training Program utilized that format to help First Year Students in SLU's Health Sciences Learning Community. This "Crash Reel Night", held on Monday, November 14, 2016 at the Reinert Residence Hall, was a great success! 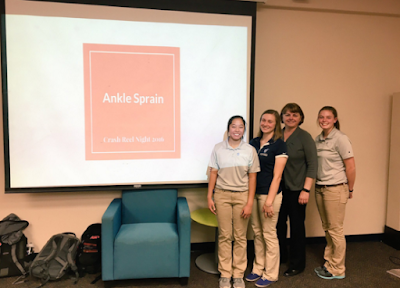 Athletic Training students Sarah Haenchen, Amelia Meigs, and Stephanie Ross along with faculty member Kitty Newsham PhD, ATC showed the Health Science Learning Community videos of injuries and talked about how an athletic trainer manages an injury. Using the videos gave the participants a clear picture of the nature and the context of the injuries. This year we focused on an ankle sprain, one of the most common injuries an AT treats. The discussion encompassed acute care on the field, the assessment in the clinic, and then rehabilitation for an ankle sprain. We had some hands-on activities such as functional tests to evaluate balance and proprioception which inform return to play decisions. The athletic training students have been busy this November and we are excited for our future events!